The site of lavish real estate offices when it opened, Miami’s once-elegant Pacific Building ended its life as a high-rise hobo jungle. 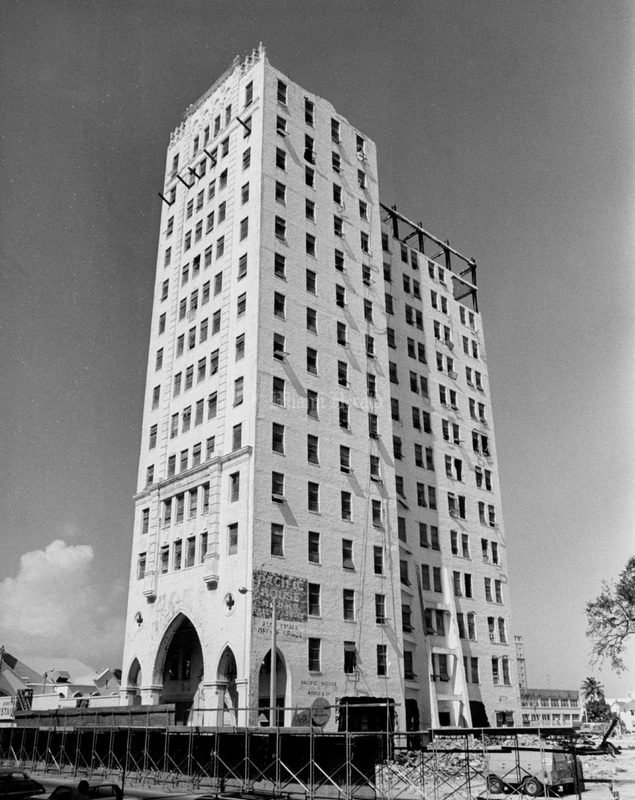 The 15-story building at 327 NE First Ave. was started in 1924 as the Realty Board Building. Badly damaged in the hurricane of 1926, it nevertheless survived until being razed to make room for a downtown campus of Miami-Dade Junior College. 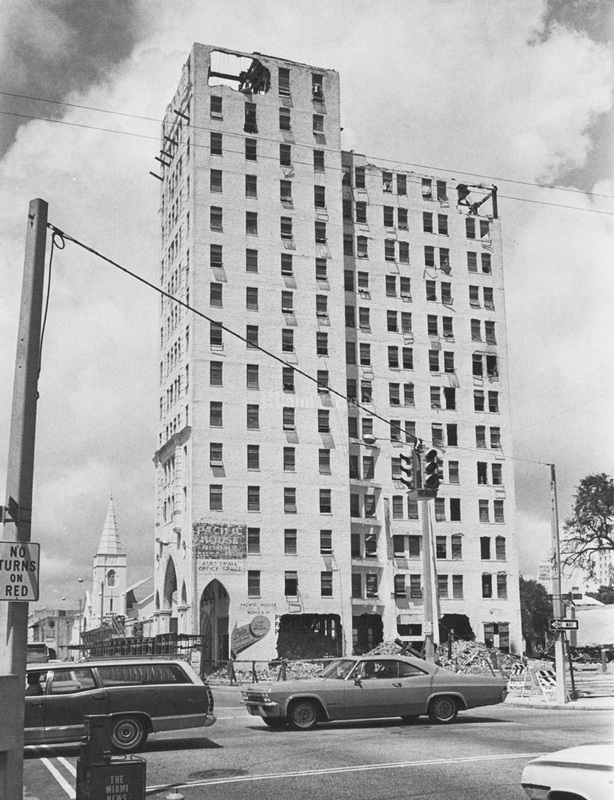 As wreckers and county officials spent the summer of 1970 arguing how the old landmark would be leveled (dynamite was ruled out) the down, the out and the luckless enjoyed a few more months of high-rise, low-cost living. 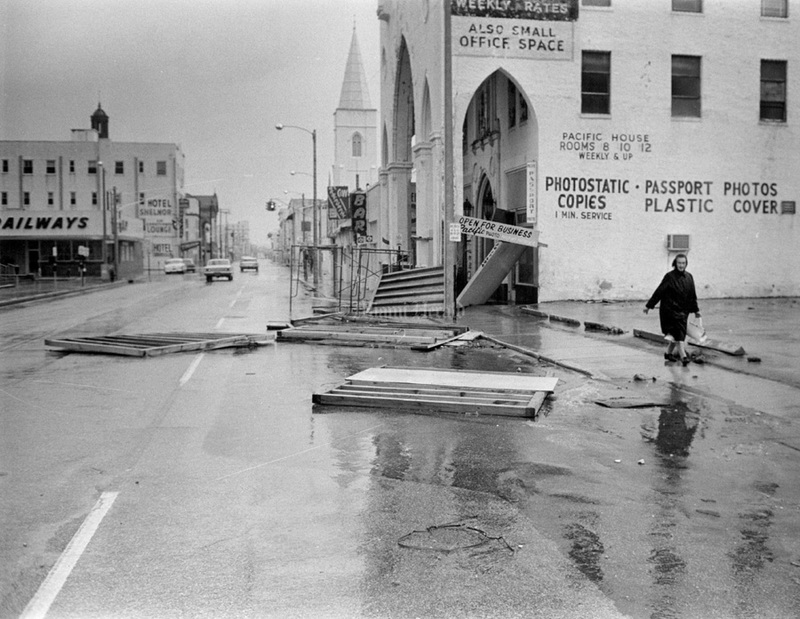 9/8/1965: Albert Coya/Miami Herald Staff -- In the wake of Hurrricane Betsy, the Pacific Building, at right, clearly is NOT "Open for Business" as the fallen sign in the entryway alleges. This was the scene at Northeast First Street and Fourth Avenue, Miami. 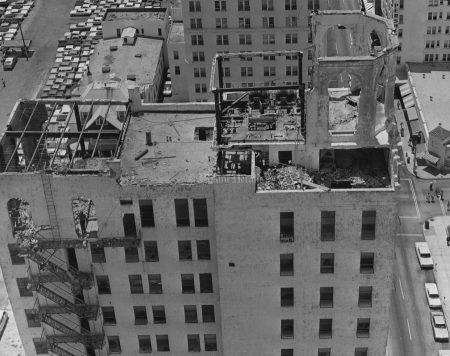 8/18/1970: Bill Kuenzel/Miami Herald Staff -- Birds-eye view of demolition of the Pacific Building. There is no indication on the back of this photo (a "used" date or residue from an engraving tag) that it ever was used in the newspaper. Of this photo, veteran Herald photographer Battle Vaughan wrote: "This undoubtedly was a helicopter shot, maybe with the assistance of a telephoto lens. We had a great working relationship with the old Miami Helicopters that were based on Watson Island (using the old Bell 52 bubble-front choppers from the Korean War era, which were small and could go anywhere) and they would pretty much fly us however we needed. 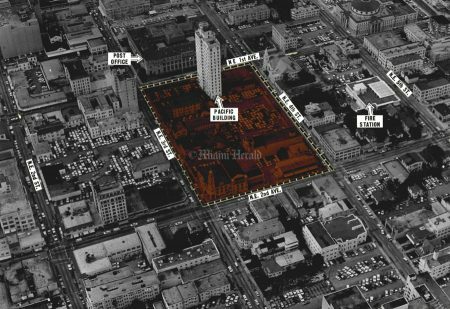 I once shot a photo of downtown from a similar apparent altitude, using a fisheye lens attached to the skid on the helicopter, so I know they were able to do that. Things are a little more regulated now, I think. 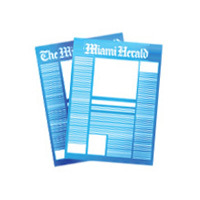 Kuenzel was great friends with the owner of Miami Helicopter, and we used them frequently." 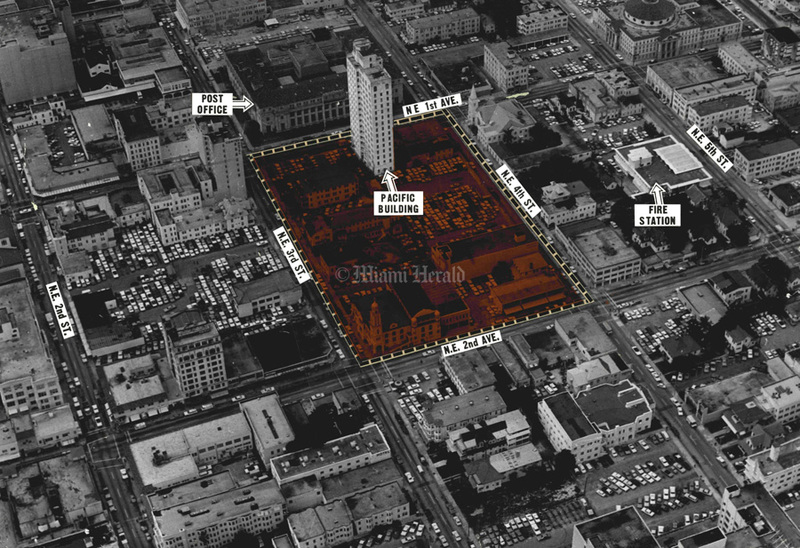 1/16/1969: Doug Kennedy/Miami Herald Staff -- Aerial view of site of proposed downtown campus for Miami-Dade Co. Junior College. A newspaper graphic artist has labelled landmarks and created an overlay of the campus site, highlighting the Pacific Building. 8/21/1970: Bob/East/Miami Herald Staff -- Pacific Building demolition. Second picture. 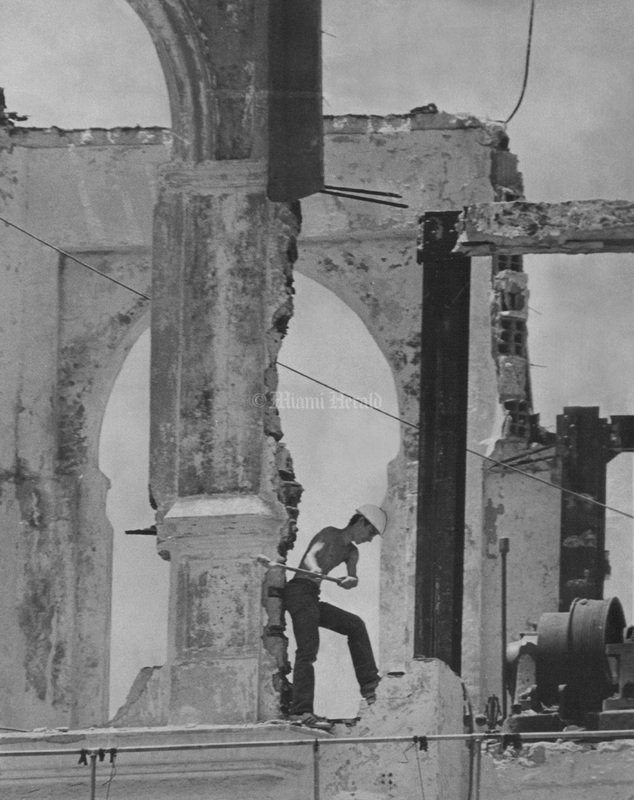 9/29/1970: Joe Schuppe/Miami Herald Staff -- Rubble of the Pacific Building. Shot 6-15-1970: Bill Kuenzel/Miami Herald Staff -- Chipping away. 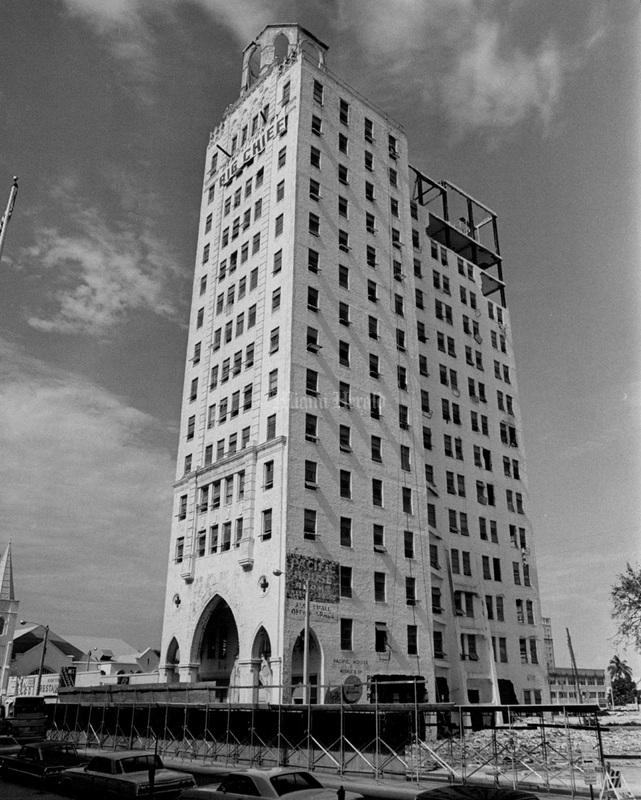 Rome didn't fall in a day, and neither is the Pacific Building. Workmen are whacking away at the top five floors, lowering the debris to the ground by the bucketful. When the top floors are dismantled in two or three weeks, the wreckers will crumble the rest of the 15-story building at 327 NE First Ave. with a crane boom. The entire structure should vanish in 60 days. This photo was made from the roof of the Cortez Hotel. 1970: Cover page (page 1 section letter D) of the COMPLETE LOCAL NEWS section of the CITY edition of The Miami Herald issue published Thursday, May 7, 1970. Features ONCE-PROUDEST TOWER GIVES WAY TO M-DJC by NIXON SMILEY/Herald Staff Writer with associated photograph "Poorly constructed building is facing wrecker's ball ...structure is being razed to make room for $10-million complex" Herald Staff Photo by JOHN WALTHER. 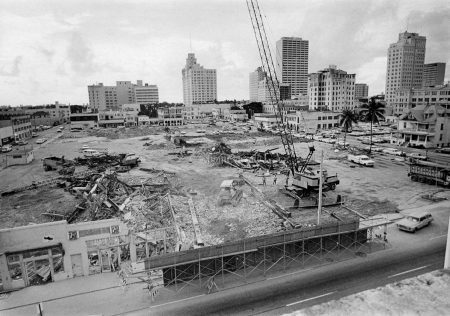 1970 8/21/1970: Bob/East/Miami Herald Staff -- Pacific Building demolition. Photo taken from cornerstone of post office building across the street. 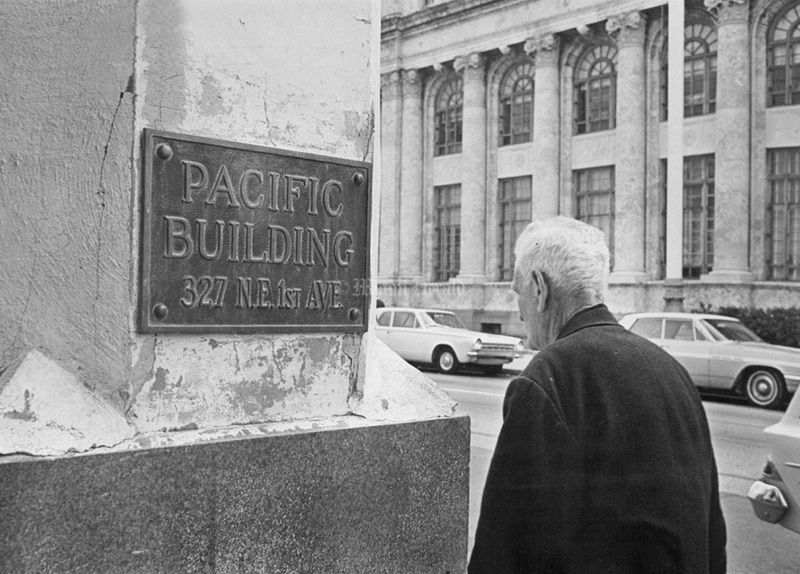 1970 [Pacific Building] Shot 9/9/1970: Albert Coya/Miami Herald Staff -- Death watch. 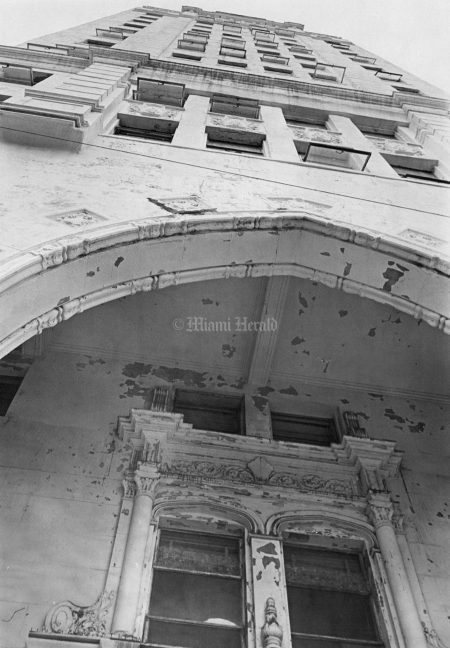 The wintry-faced men crane shielded eyes upward into the sun and the death scene, transfixed, private errands forgotten for a moment in the reflected spectacle of the Pacific Building, an aged landmark of downtown Miami and sanctuary for derelicts, crumbling under ball and chain -- a showcase skyscraper denied sanctuary itself when it became a derelict in age. 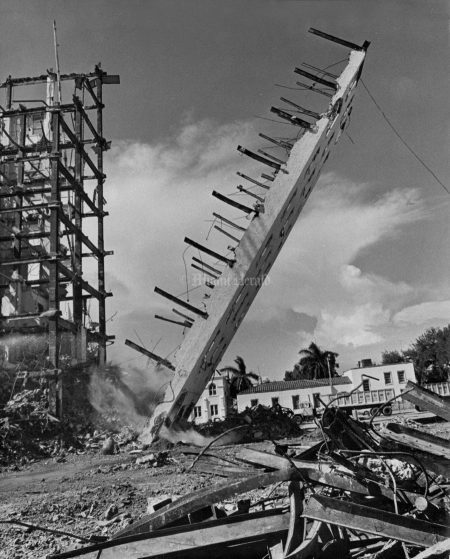 1970 [Pacific Building] Shot 9/18/1970: Gus Schuettler/Miami Herald Staff -- Comes... An eight-story high wall of the Pacific Building, which took many months to erect in the 1920s, comes toppling down in seconds like a giant domino under the handling of wreckers who felled the mass of concrete and steel onto a spot cleared for it in a block ringed by downtown Miami business structures. 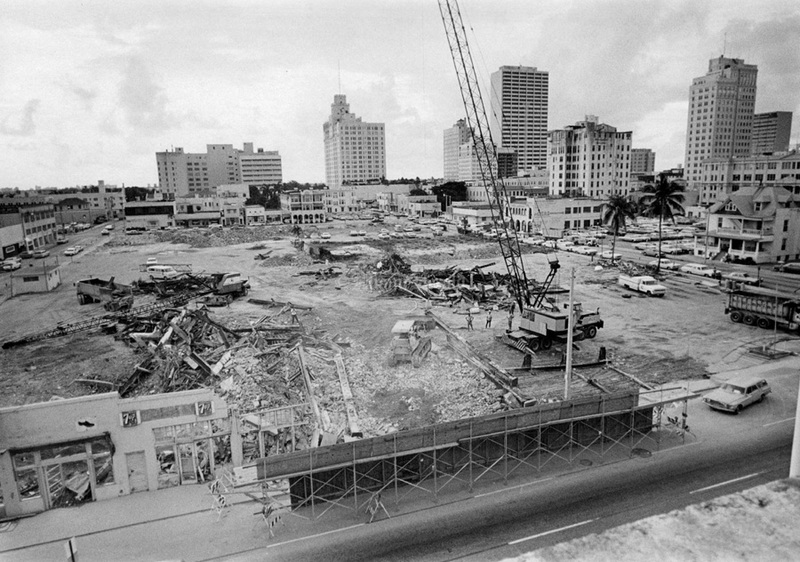 The feat Friday was a major step in leveling the site for construction of a downtown campus for Miami-Dade Junior College and contrasted with weeks of drudgery required to turn the building into a structural shell. 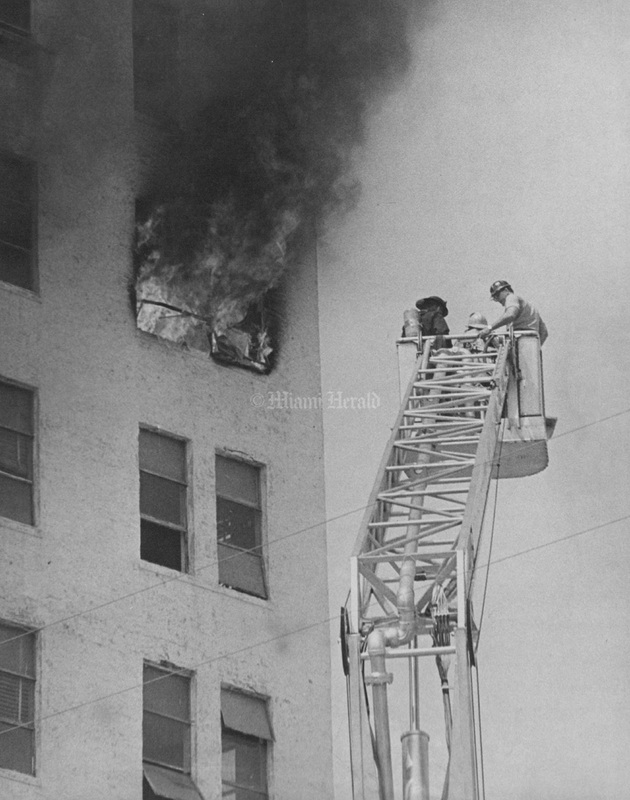 5/3/1965: John Pineda/Miami Herald Staff -- Pacific Building, 327 NE First Ave. 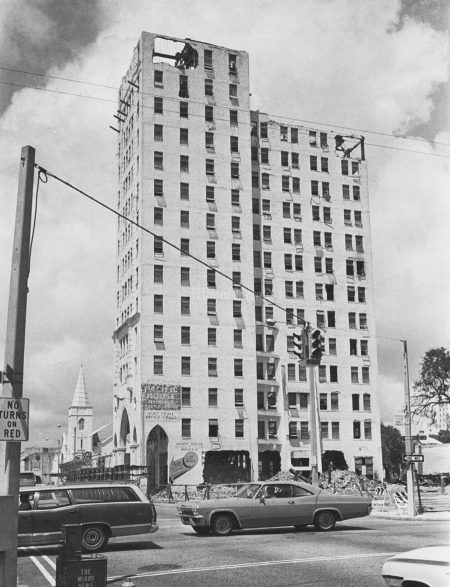 Shot 5/3/1965: John Pineda/Miami Herald Staff -- Pacific Building, 327 NE First Ave. City orders it repaired. Repairs are needed. 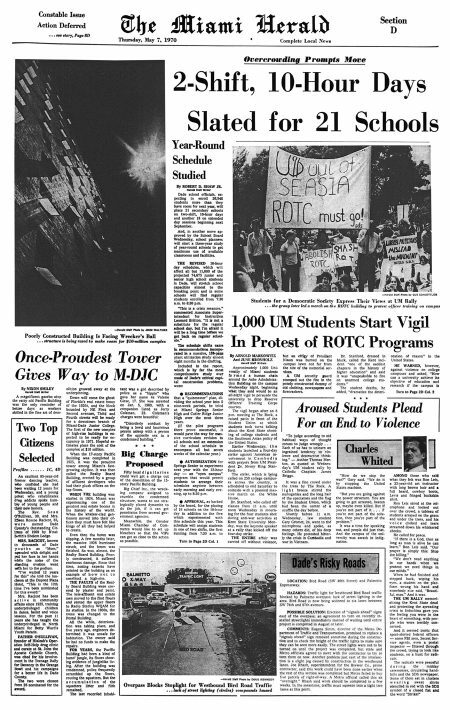 Shot 7/8/1969: John Pineda/Miami Herald Staff -- Fired again. 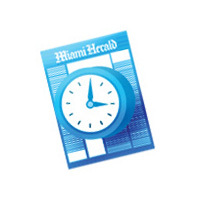 There was another fire at the old Pacific Building in downtown Miami Tuesday. 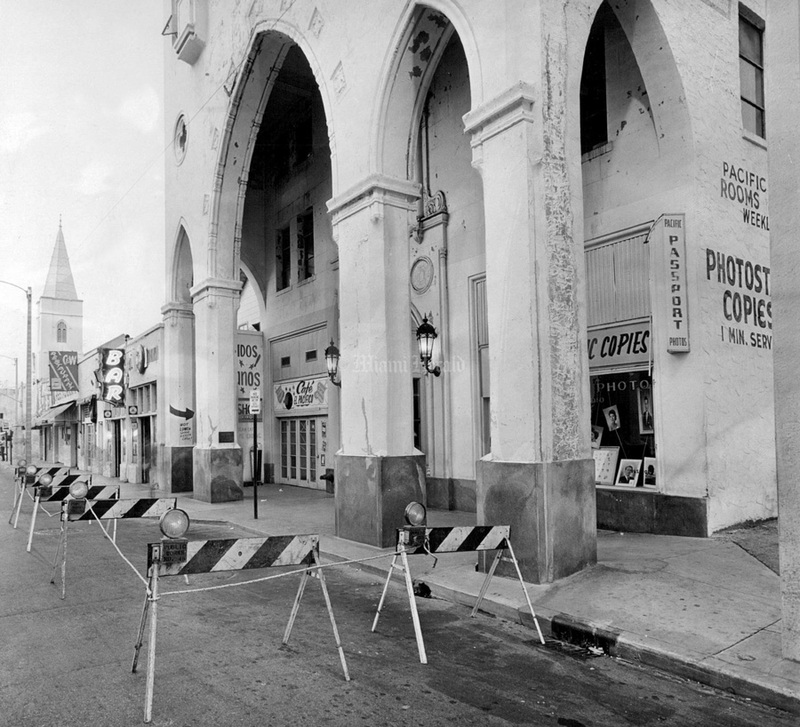 While Metro commissioners keep looking for $100,000 to raze the condemned structure, hoboes and hippies hang out in its filthy interior, leaving cigarette butts to ignite the paper, rags and furniture left when the structure was closed in 1967. Tuesday's blaze was on the eighth floor and required only five minutes to douse once firemen rode their snorkel equipment up the side of the structure at 327 NE First Ave. District One Chief Dan Heyder said two rooms were "burned out" in the "10th or 15th call we've had there in a year." 9/3/1970: John Pineda/Miami Herald Staff -- Pacific Building demolition. 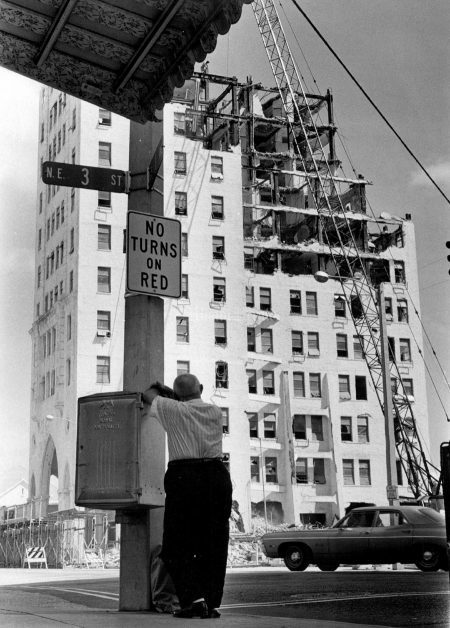 5/7/1965: Bill Sanders/Miami Herald Staff -- Miami police were ordered to barricade the 17-story Pacific Building by City Manager M.L. Reese "for the protection and safety of the public." Building Department inspectors have called the building a safety hazard because concrete on the building face is falling off. People living or working at the building can enter and leave through one entrance. 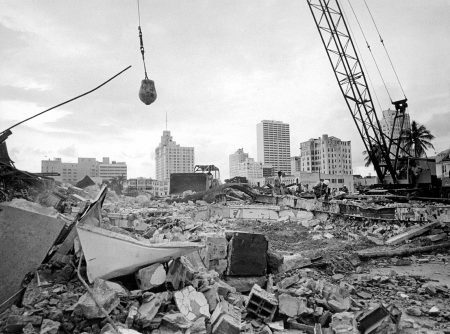 9/29/1970: Joe Schuppe/Miami Herald Staff -- Pacific Building rubble.